Watch who liked other fan pages, possible? CPA Elites - CPA Marketing Forum SEO, Social Media, Code & Webmaster Social Media - YouTube, Facebook, etc. Watch who liked other fan pages, possible? What's up people, how are you! 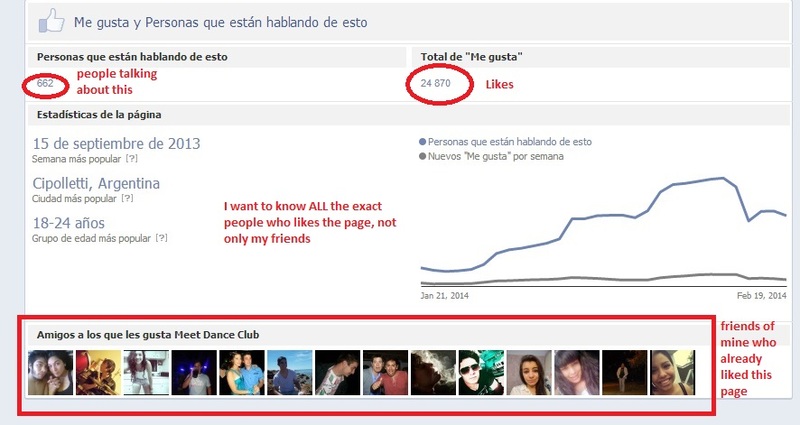 I wanted to ask you, does anyone know if it is possible to see who exactly liked other fan pages? For example, watch images below. I've written in them so you can understand better what i'm asking. I just can see with detail who liked the page if i have them added as friends. Is it possible with any program or any way to see with DETAIL all the people who liked this fan page (or any fan page in general)? Maybe you're wondering why do i need this, or maybe not ._. (anyways if this is possible it'd be a really valuable info for any kind of IM). If u think carefully, i think it's an original idea. Imagine that i manually add 300 people, but i manage to distribute them my coupon. It would be great. I've tried FBLeadChef for scrapping emails and inviting them directly from fanpage, but it only gives me Facebook emails and noone ever checks email (atleast the people i'm targeting). So, if u can help me, I WOULD REALLY APPRECIATE IT. I'm in college, and i need this extra money. If you got to this part, i have to say thank you for reading such a long thread that doesn't offer much for you. I don't really think thats possible, unless you own the page or are friends with them.